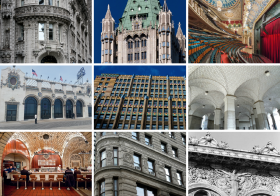 When we think of the city’s early skyscrapers, landmarks like the Woolworth Building and Flatiron Building usually come to mind. But there’s an equally fascinating and beautiful icon that often gets overlooked–the 1914 Manhattan Municipal Building. 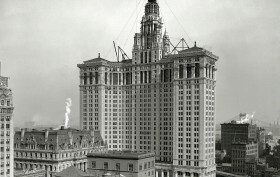 One of New York’s first skyscrapers, the 580-foot Beaux Arts masterpiece influenced civic construction throughout the country and served as the prototype for Chicago’s Wrigley Building and Cleveland’s Terminal Tower, among others. A new video from Blueprint NYC (produced by the Office of NYCMedia) takes us into this historic structure, discussing everything from the reason for construction (after the 1898 consolidation of the five boroughs, there was a need for increased governmental office space) to interesting factoids (the building was designed from a rejected sketch of Grand Central Terminal Station) to the turn-of-the-century innovations that made this unique structure possible.